Roger Federer has set his sights on claiming an eighth Wimbledon title this summer after the latest chapter of his remarkable 2017 ended with him winning the Miami Open. 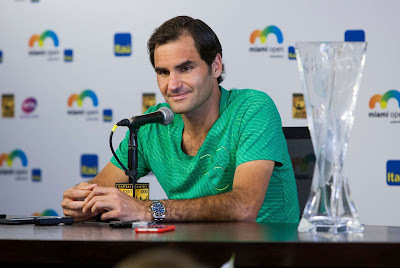 Having won the three biggest tournaments played this season, in Melbourne, Indian Wells and Miami, Federer is looking ahead and says he will concentrate on grass and hardcourt tournaments as opposed to those on clay. After defeating Rafael Nadal to win Miami, Federer told ESPN in a courtside interview that he would "probably won't play any" of the clay-court tournaments "except the French." In a press conference after the match, Federer said he wanted to take a break to recover physically and mentally and to be with his family. He is 19-1 since returning from an injury layoff. "Wimbledon has to be the biggest goal," he said. "The American hard courts I guess as well. The French Open I guess to some extent. It's just we'll see what happens, you know. No pressure there really because I won't have a preparation as such. "But all of the grass really is important to me because I'll play Stuttgart and Halle there, too. Then of course I am looking very good for the World Tour Finals, for the year-end championships, where I've been very successful. I like the indoors as well. So for me basically the second half of the season is a big priority now. That's why I'll take a break as well. "My knee was strange on the clay last year so maybe being away from it as much as possible is a good thing as well, even though I don't think it was because of the clay as such. "But my physio, my fitness guy, thought that could be a good thing not to be too much on clay. I feel very comfortable, very confident it is the right decision. "When I am healthy and feeling good, I can produce tennis like this. When I am not feeling this good there is no chance I will be in the finals competing with Rafa. "That is why this break is coming in the clay court season, focusing everything on the French, the grass and then the hard courts after that." Federer repeated that he is currently scheduled not to play before the French Open, but added that he would "see how all of the buildup is going to go." But regardless of his schedule, Federer is determined to keep the refreshed mentality and attacking mindset that he has used so successfully in his comeback. "I think that the way I'm playing right now is the right way for me moving forward as well,” said Federer. "Of course I'll always recalibrate every tournament I go to depending on the speed of the ball, the speed of the courts, who I play. I'm happy that I was able to stay on the offensive more or less throughout this swing here, Indian Wells and Miami. I think once you win a big tournament like the Australian Open, or any big tournament for that matter, you can just bank usually on some confidence, you know. "I think I am definitely profiting from confidence, and then also from the right mindset, able to compress all my energy into one single match and not be distracted by everything else going on around me."